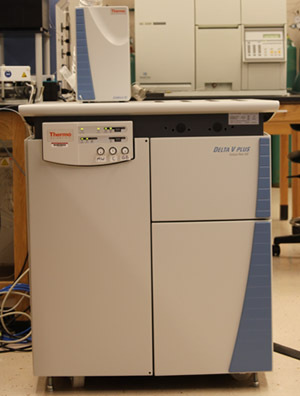 CASIF measures stable isotope ratios of carbon, nitrogen, hydrogen, and oxygen in environmental samples of solids, liquids, and gases using Thermo Fisher Delta V+ isotope ratio mass spectrometer interfaced with various peripheral devices. The Delta V+ has a universal triple collector (for C, N, and O) and a H2 collector with two additional faraday cups for m/z 2 and 3. The appropriate reference gases as well as sample gases enter the mass spectrometer via a Conflo IV Universal Interface from Thermo Fisher. The GasBench II is a continuous flow preparation device and inlet system with repetitive loop injection of gases. Possible analyses include isotopes of carbon and oxygen in carbonates, isotopes of nitrogen and oxygen in nitrate using the denitrifier method, and carbon isotopes in air. Carlo Erba NC 2500 Elemental Analyzer with a Costech zero-blank autosampler allows analysis of carbon and nitrogen isotopes in organic samples such as leaf tissue, wood, and soil. 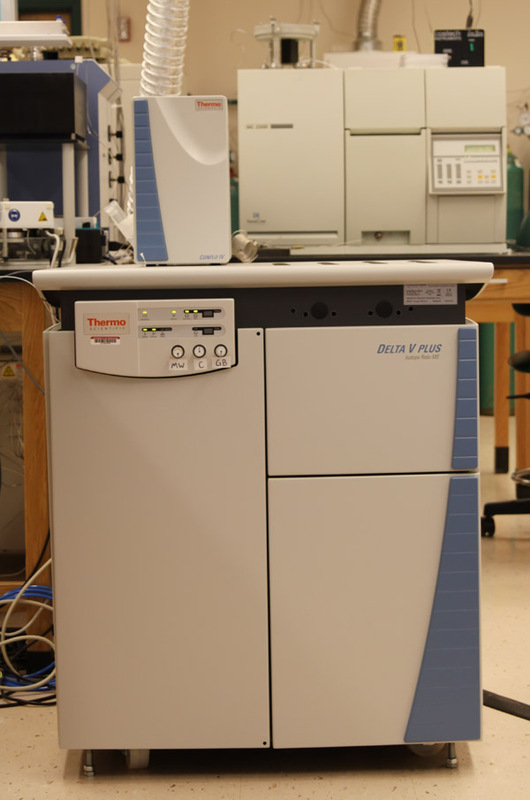 TC/EA (or Temperature Conversion Elemental Analyzer) from Thermo Fisher is used to measure the 18O and 2H isotopes in organic compounds and water. For water, a GC-PAL autosampler is used to inject liquid into the top of the reactor column. The spooling wire microcombustion device is based on a design introduced by Brand and Dobberstei (1996), and then optimized Sessions (2005), for analysis of carbon isotopes in nonvolatile organic compounds. The instrument at CASIF is primarily used for analysis of pollen grains.